(Scroll down for video) A mother got a bill from New York City after her son was killed by a New York City Police Department police car, according to reports. The bill has caused outrage against the city for being very insensitive to a grieving mother. Later, New York authorities have apologized for sending a collection letter to a man who was killed by a police patrol car, billing him $710 for the damage he did to the body of the vehicle. 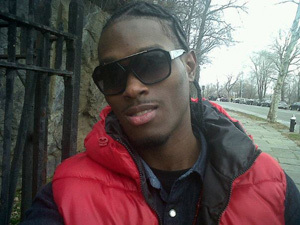 Tamon Robinson died in April during a police chase in Brooklyn, New York. Police caught him digging up cobblestones when he fled on foot when he was hit by the police car. Then, Robinson's mother received a letter from a law firm hired by the city. It was addressed to her dead son and asked him to pay for damages within 10 days. Dobbinson said: "We are still grieving, and this is a slap in the face. They want my son to pay for damage to the vehicle that killed him. It's crazy." The police also broke down the door of the family apartment on the day of the funeral of Robinson. However, the door was repaired later, saying they executed a search warrant at the wrong place.